Guru Mani Madhava Chakyar (Māni Mādhava Chākyār) (15 February 1899 – 14 January 1990) was a celebrated master performance artist and Sanskrit scholar from Kerala, India, considered to be the greatest Chakyar Koothu and Kutiyattam (2000 year old Sanskrit theatre tradition) artist and authority of modern times. He was considered as the authority of Abhinaya (Classical Indian acting style) and Nātyaśāstra. 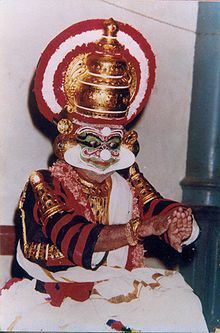 "My own people condemned my action (performing Koothu and Kutiyattam outside the precincts of the temples), Once, after I had given performances at Vaikkom, they even thought about excommunicating me. I desired that this art should survive the test of time. That was precisely why I ventured outside the temple"
- Guru about the difficulties he had faced from hardliners when he tok Koothu and Kutiyattam outside the temples and performing it for common man. “his Netraabhinaya is simply incomparable"
- Paderewski Foundation (New York) Certificate (New Delhi, 1964) - First International recognition for Kutiyattam and the maestro. ↑ P.T. Narendra Menon, Kulapati of Koodiyattam, Sruti- India's premier Music and Dance magazine, August 1990 issue (71), p. 27. ↑ p. 21 Natya, Bharatiya Natya Sangh, 1962. ↑ Sruti- India's premier Music and Dance magazine, August 1990 issue (71), p. 17. ↑ Kapila Vatsyayan, Gurupuja, Mathrubhumi weekly, February (11-17) 1990, p. 7. ↑ Akavur Narayanan, Shatam Jiva Sharadah, Mathrubhumi weekly, March (15-21) 1987, p. 20. ↑ L.S Rajagopalan, Mani Madhava Chakyar- A Titan of A Thespian, Sruti- India's premier Music and Dance magazine, August 1990 issue (71), p. 17. ↑ P.T. Narendra Menon, Kulapati of Koodiyattam, Sruti- India's premier Music and Dance magazine, August 1990 issue (71). ↑ L.S Rajagopalan, Mani Madhava Chakyar- A Titan of A Thespian, Sruti- India's premier Music and Dance magazine, August 1990 issue (71). This page was last edited on 5 August 2017, at 22:28.